Well I've been lurking on here for years, finally I've managed to get a board up (using an old bed to make the base). I've still a little work to do on the board. Now I'm just waiting for my royal scot set I got on ebay to arrive. Its going to be a dcc layout in the long run. That looks exciting. It should be fun! Well I've a hell of a lot of work to do on it, I was looking at an incline to a raised station, but I have my doubts the locos would handle it. Getting the split chassis bachman converted to dcc should be interesting. I would of liked a larger one, but I moved into the corner because my partner wants the bay window back lol. You have done the hard bit ----------- by starting. Now comes the enjoyable bit. Looking forward to see the next instalment. Like that Chinese chap said. "The journey of a thousand rails starts with an 8 by 4"
Have fun and don't rush at it. Good luck. Good to get started bud! 8x 4 is a good size. You can fit a fair amount in. Whats your plans for scenery? 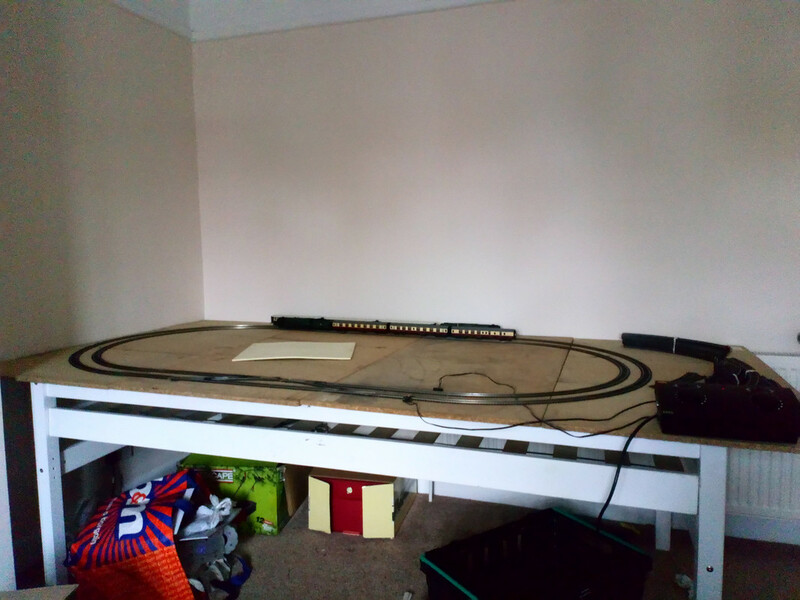 Can the layout be pulled slightly right in the photo as I doubt you'll be able to reach the back corner to keep the track clean. Thanks guys for all the replies, it's very encouraging! Scenary wish, I'm having a rethink, I wanted a raised end terminal that hid part of the layout in a tunnel these mercenary doesn't seem to cope with much of an incline. I want a town scene and goods yard. Layout will probably be a tweaked version of that (I'm considering a turn table). I was originally going to get finescale track, but I think what I'm fine with what I have, I'm still debating for or 5 car trains. You picked up that bachmann set at a great price! And they make some really nice models to. My feelings were they definitely pulled ahead of hornby in their overall build quality but the last maybe 10 years especially hornby really stepped up their game. Im looking foward to watching you progress! joshv8 wrote: I like your goods area. Im guessing those are radius 1 curves on the inside? I drew this and no, R2 is the minimum (as are the points, of course. Using R4 and R3 as the double mainline oval limits severely what you can do with rest space, even more so if you want to step up from the setrack R2 points. The return loop here was to get the most of the sidings, rather in other variants when its main use is to turn tender engines. This version was titled "modern" thinking about non-loco hauled passenger stock which is much easier to turn around. It's on the curve because *width* is so critical and a platform along the horizontal causes design problems . Even trying to be as smooth as possible, these curves look and work much better with shorter coaches and engines which is where "modern" tends to get more difficult. Four inches wider and R2 curves can be made to disappear. That or go to multi levels and single track with passing loops. The return loop is down to the short light green section. DC or DCC it can be made automatic. I didn't design it tbh, but it seemed like a good basis for a layout that will probably evolve as I get more bits. I've got plans for a 9f so I think that will have an effect on the final design. Thank you. Yes, the third loop is not intended as a running oval. The pink half loop on the left is a bi-directional terminal road and a headshunt for the majority of the sidings. Busy. The dark green half-loop is again headshunt and to allow locos to come on to/off either end of a rake of coaches sitting at the pink track platform. The sidings can be arranged to taste. The two mainline ovals are as unencumbered as possible, (only one facing point on each) and the only interruption is for the red track when a pink/yellow train movement is needed. All other movements are clear of both main lines. Itsonlyme wrote: I've got plans for a 9f so I think that will have an effect on the final design". Big engines are popular, but on this size of layout they can't be given the coaches or wagons they deserve. I'll stop there as rule 1 applies: "It's my railway and I'll have i the way I want it." It is a shame I've been ordered into the smaller space and I can't run the larger trains. I will certainly be running some smaller engines, I do like the little tankers.